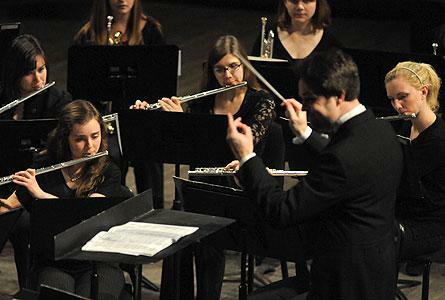 The Hope College Wind Ensemble will perform on Friday, Feb. 15, at 7:30 p.m. in Dimnent Memorial Chapel. The concert is titled “People, Places, and Things.” The cornerstone of the evening, “Angels in the Architecture,” by Frank Ticheli, will feature soprano Rebecca Flinker, a sophomore from Leeds, Mass. Other pieces include “Hammersmith,” by Gustav Holst; “Movement for Rosa,” by Mark Camphouse; and “Sleep,” by Eric Whitacre. Director Gabe Southard, who joined the Hope faculty in 2007, completed his Doctorate of Musical Arts in conducting at Michigan State University. Prior to his residence at MSU, he served as wind symphony conductor and flute studio teacher at the University of Michigan-Flint, where he also taught orchestration, music appreciation and advanced conducting. HOLLAND -- In Honor of National Girls & Women in Sports Day, Hope College athletics invites middle school girls to attend a special evening of events to celebrate the energy and the sports achievements of girls and women on Wednesday, Feb. 6. The Jack Ridl Visiting Writers Series of Hope College will feature poet Shane Book and novelist Mat Johnson on Thursday, Feb. 7, at 7 p.m. in the Knickerbocker Theatre in downtown Holland.